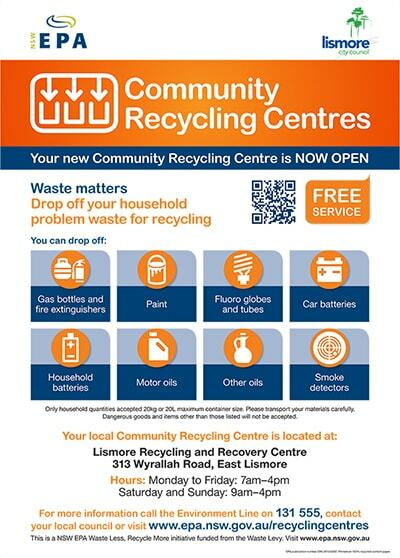 Our Community Recycling Centre is located at the Lismore Recycling & Recovery Centre, 313 Wyrallah Road, East Lismore. Opening hours are Monday to Friday from 7am to 4pm and Saturday/Sunday from 9am to 4pm. Residents can now drop off the following household problem waste items for free, helping to minimise our community's impact on the environment. Only household quantities of the above materials will be accepted. As a guide a maximum container of 20 litres or 20 kilograms each of the wastes listed. By separating your problem wastes and taking them to your local CRC, you are helping to improve recycling, reducing waste going to landfill and looking after your local environment. CRCs are free for all NSW residents. For more information read the Community Recycling Centre brochure. To locate other CRCs across the Northern Rivers region visit North East Waste or NSW EPA Recycling Centres.